Catching Fire was written by Suzanne Collins. 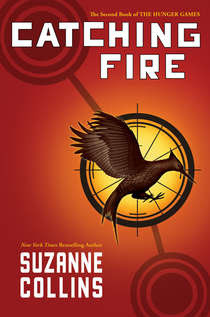 It is the book 2 in The Hunger Games Trilogy. The terrifying sequel to The Hunger Games. My opinion is really completely in my Hunger Games post. I have to just add... that after reading the entire trilogy... I think the covers are perfect. I'm just horrible for judging a book by it's cover since I don't know what the cover means.